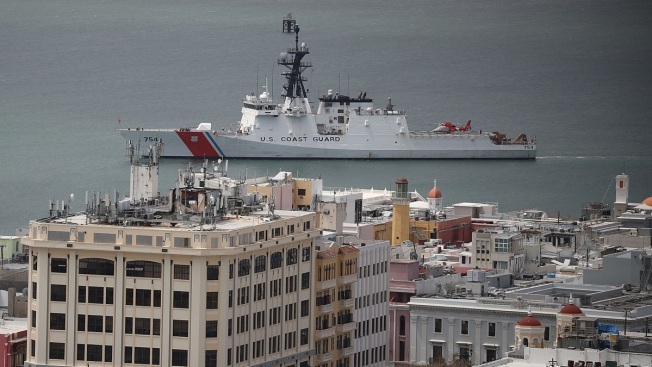 A U.S. Coast Guard cutter is seen in port as people deal with the aftermath of Hurricane Maria on September 25, 2017 in San Juan Puerto Rico. President Trump said Wednesday that he was considering lifting a nearly century-old shipping law to help Puerto Rico recover from devastating hurricane damage, though he also noted that the shipping industry would be opposed to a waiver. The Jones Act, a 97-year-old law that passed after World War I to protect the U.S. shipbuilding industry, requires that domestic shipping must be carried out by U.S.-owned, U.S.-made ships staffed by American crews. Critics of the act say it is limiting the delivery of potential aid to Puerto Rico by foreign vessels and will drive up prices for people on the island. Multiple studies have shown that the act has cost Puerto Rico’s economy billions of dollars. Eight members of Congress wrote a letter to the Department of Homeland Security urging the administration to waive the law. Republican Sen. John McCain has also called for the act to be scrapped. Puerto Rico’s governor, Ricardo Rossello, said earlier Wednesday that he expects the Jones Act to be waived. He told CNN that the act was temporarily waived during Hurricane Irma, which he said was much less devastating than what Puerto Rico is facing. Rossello said his administration has talked to members of Congress from both parties. The government has given varying statements on the Jones Act in recent days. Elaine Duke, the DHS acting secretary, told reporters on Wednesday that there have been “no known waiver requests” for the Jones Act. But the DHS acknowledged the letter written by members of Congress in favor of scrapping the act. "We have received a request from members of Congress -- which is not a normal way that waiver requests come in -- but we're going to evaluate the issues they've raised," a senior DHS official told reporters in a conference call Wednesday, CNN reported. "Our general counsel is evaluating whether members of Congress have standing to request such a waiver." White House press secretary Sarah Sanders said such a waiver is not yet needed, CNN reported. The DHS also said Tuesday that officials thought waiving the Jones Act would be unnecessary. An assessment by the DHS showed there was "sufficient capacity" of U.S.-flagged vessels to move commodities to Puerto Rico, spokesman Gregory Moore said in a statement to Reuters and NBC News. "The limitation is going to be port capacity to offload and transit, not vessel availability," Moore said. "Most of the humanitarian shipments will be through barges, which make up a significant portion (along with tugs) of the US-flagged cargo fleet." The Jones Act was waived after Hurricanes Harvey and Irma to facilitate the movement of petroleum along the East Coast, and to make up for the loss of high capacity pipelines, Moore said. "The situation in Puerto Rico is much different," he said. But critics of the Jones Act say that vessel availability isn't the issue. It's the higher prices Puerto Ricans must pay. McCain has been a long-time critic of the Jones Act and has previously drafted unsuccessful legislation to repeal it. A senior DHS official said the Jones Act doesn’t allow the department to grant waivers solely to keep costs low, The Wall Street Journal reported. Waivers must be based on whether or not the there are enough U.S. ships to keep up with shipping needs, which DHS is saying there are. Only the Department of Defense can obtain a Jones Act waiver automatically, as it did to transport petroleum products from Texas after Hurricane Harvey. The Shipbuilders Council of America did not respond for comment on the Jones Act, but according to its website the council strongly supports the act, calling it "vital to America’s economic, national and homeland security." NBC reached out to DHS to clarify the status of a potential waiver for the Jones Act and what constitutes a formal request, but DHS has not yet responded.